Cleaning out the gutters is probably not at the top of the list of favorite DIY projects for most homeowners, but it is an important chore that protects the value of your home. There are many gutter cleaning services out there, but if you're comfortable working on a ladder, you can save yourself the cash by doing it yourself. Cleaning gutters isn't that difficult, it just requires going up and down the ladder repeatedly and constantly re-positioning the ladder to reach all parts of the gutter. 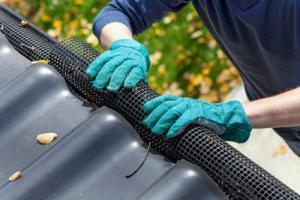 Heavy duty work gloves are a prerequisite for any gutter cleaning project. Position the ladder at one corner of the house, making sure the legs are on firm, level ground. Climb up with a gutter cleaning tool (an ordinary garden trowel works fine) and a five gallon bucket or a plastic trash bag to collect the debris. 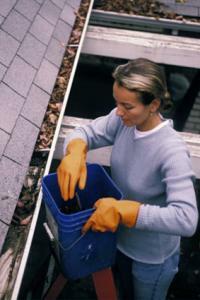 Scoop out the debris in the gutter with one hand and put it into the bag or bucket. Once you've scooped out as much as you can safely reach from the first position, move the ladder down to the next position and repeat the process. Empty the bag or bucket each time you come down so it doesn't get too heavy. After one length of gutter is cleaned, go up the ladder one last time with a hose outfitted with a high pressure nozzle and spray out the remaining dirt and small bits of debris in the bottom of the gutter, washing it toward the downspouts so it drains away. Do House Chores Burn Calories? If you've let your gutter go too long between cleanings and find that your downspouts are not draining freely, you'll need to unclog them. If the hose doesn't work, a plumber's auger can be used to burrow through the debris and get your downspout draining again. Those are the basic instructions, but these tidbits can help the project go more smoothly. Use a ladder stand-off device. It attaches to the top of the ladder and allows it to rest against the wall of the house below the gutters, so you don't have to lean the ladder directly on the gutters and risk damaging them. A simple S-hook from the hardware store can be used to hang a five gallon bucket from the top rung of the ladder, freeing up both of your hands to do the work. Depending on what is underneath your gutters, you may just want to toss the leaves on the ground and rake them up later, or spread out a tarp to collect the debris. Cleaning gutters is potentially a dangerous job. If you have a two-story home, it's generally best to leave gutter cleaning to professional company. If there are no trees hanging over your house, your gutters may never need cleaning - but it's still a good idea to climb up and check them once a year. If you have enormous deciduous trees hanging over your house, you may need to clean your gutters once per season or more. How often to clean them is determined by how much is falling into them. If you have lots of big trees around, it's probably worthwhile to invest in gutter guards, which are screens that snap on to the gutter to let the water in and keep the debris out. 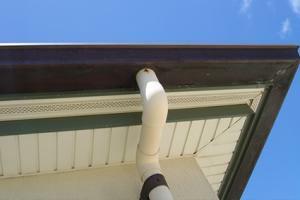 Gutters are designed to move rain water away from the house as it pours down the roof. If you don't clean your gutters regularly they may become clogged - making a lot of extra work for you - and possibly resulting in serious damage to your home. The water may pour right over severely clogged gutters and then trickle back along the outside of the gutter and roll down the side of the house, causing stains, mildew and eventually, rot. If the downspout is clogged, water may collect in the middle of the gutter causing it to sag and creating a waterfall that has even more potential to cause damage. 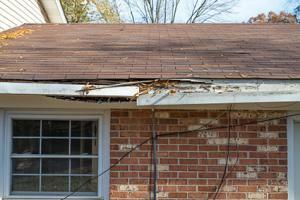 Gutters that are heavy with standing water and lots of debris can actually pull off the house from the weight. If you keep your gutters clean and the water flowing freely, your gutters will last longer and you can rest at night knowing they are doing their job of keeping your home safe from water damage. 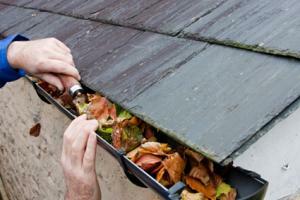 Cleaning your gutters is far from rocket science, but it is a bit tedious. Heavily clogged gutters are much more work than ones with just a bit of debris - all the more reason to do it frequently rather than putting it off.